Kim Jong-un coup rumors triggered by disappearance. 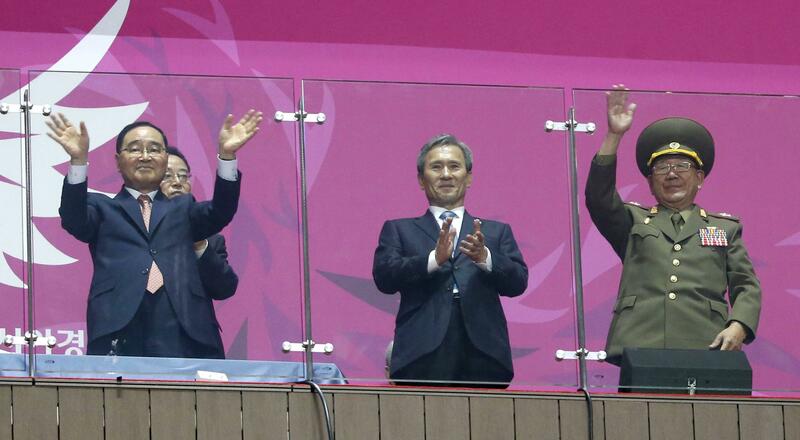 South Korean Prime Minister Jung Hong-won, left, with top North Korean official Hwang Pyong-so, right, at the Asian Games in South Korea this weekend. As Reuters writes, though, speculation about coups against North Korea’s ruling family has a long history—but they’re still in charge after 66 years and three generations of rule. There have long been rumors of a coup attempt in 1992 by Soviet-trained North Korean army officers, and later, of a planned coup by disgruntled and hungry army units in the then famine-stricken northeast of the country in 1995. In 1998 a reported shoot-out between police and soldiers led to a curfew in Pyongyang. Kim Jong-il dropped off the grid for a while, the skirmish was taken to have been a direct challenge to his rule and a coup attempt. But then he reappeared and the regime denied the firefight. In the last few years of Kim Jong-il’s reign we got coup rumor after coup rumor as his health began to fail and he disappeared from the spotlight at various times. No sooner had Kim2 gone and Kim3 taken his place than coup rumors started circulating again. Most dramatically came accusations that Jang Song-thaek, his uncle, had been coup plotting. He was executed. A North Korean delegation visited South Korea this weekend in what was described as an “unprecedented” move; the North Korean group was led by Hwang Pyong-so, who is considered the second-most powerful figure in the country.